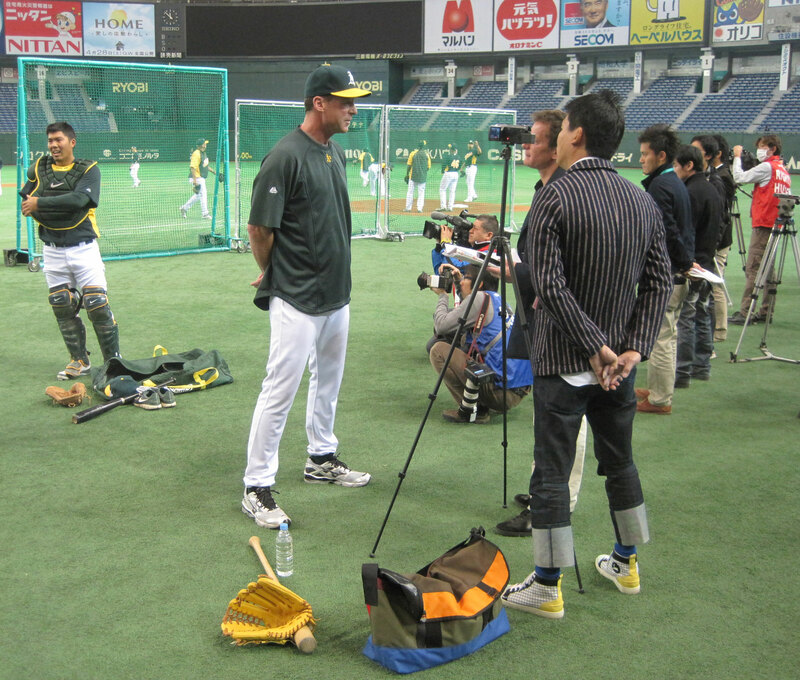 This Japanese reporter leads the league in socks. Players from both teams looked loose and light on their feet with just 31 hours until the stats start counting. 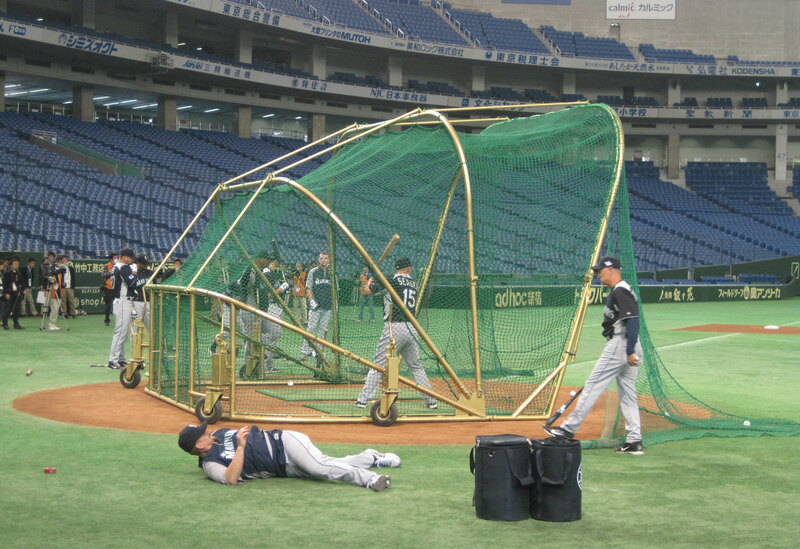 Kurt Suzuki yucked it up for Japanese photogs while strapping on his gear. Blake Beavan greeted me with a hearty “konnichiwa!” in the Mariners clubhouse, although I’m 99 percent sure he has no idea who I am. Did I do that right? I was trying to humblebrag. Sup, skip? NM, U? Chillin'. The workout was exactly as exciting as it looks, so I’ll take this opportunity to announce that yesterday at 4:14 PM I pronounced myself fully cured of jetlag. Having never previously strayed more than seven hours from Eastern Time, I came into this trip planning on a power-through strategy for adjusting to the 13-hour difference. After staying awake for the entire flight, I slept a solid seven hours the first night and expected to feel normal the following day. I did, until about 4 PM. You know when you drink half a bottle of NyQuil and then only sleep for five hours instead of the recommended eight? … just roll with it … It was like that. I was groggy and sluggish and my brain felt like it needed a walker to get around. Even though I slept well the first three nights, I’d crash every day in the late afternoon — or 4 AM, according to my body. But yesterday I didn’t feel like hibernating after lunch, so I guess I’m officially adapted to Tokyo time. Can’t wait to regurgitate those 13 hours back up in two days! Tye Waller can do more than just coach first base. At the start of a workout, players walk through a tunnel from the clubhouse to the dugout and then jog onto the field. As soon as the first Mariners begin to emerge, the Japanese media assembles. Almost a dozen photographers lie in wait, fingers on shutter buttons. John Jaso is not the man they’re waiting for. Even Felix Hernandez is not the man they’re waiting for. There he is, Muenori Kawasaki! Likely just a role player if he even makes the Mariners’ April roster, the former SoftBank Hawks infielder has been second in CFPA (Camera Flashes Per Appearance) only to Ichiro this week. 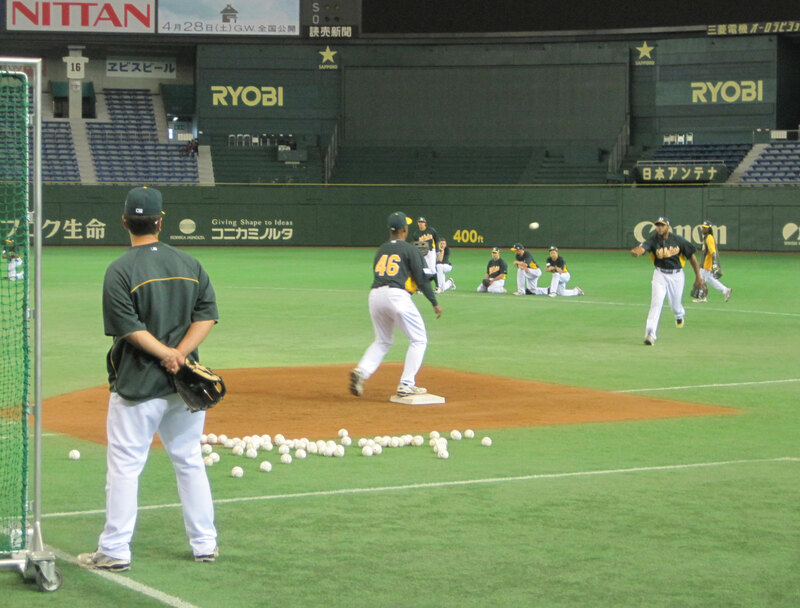 Hisashi Iwakuma ranks third. All other players are tied for fourth. And like that ... he was gone. I haven’t seen the new Mad Men yet, but it couldn’t have been much better than the show Carlos Peguero just put on in batting practice. 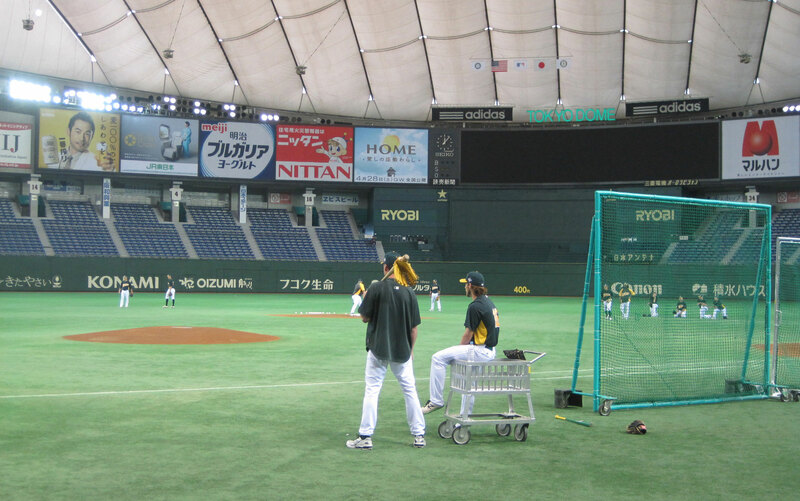 Hombre is every bit of 6’5, 235 pounds and he does not get cheated during BP. Pitch after pitch, it’s lock and unload as hard as you can. Balls were flying off the billboards in right and into the batter’s eye in center, almost hitting the speakers that hang from the center of the roof. A Peguero vs. Brandon Allen home run derby tomorrow with Ichiro pitching would be Japan’s greatest contribution to world culture since the Tamagatchi. One other note: If you spoil the Mad Men premiere for me, I will run over your foot with a John Deere. None of my 'Los Peguero photos included ballpark yoga.